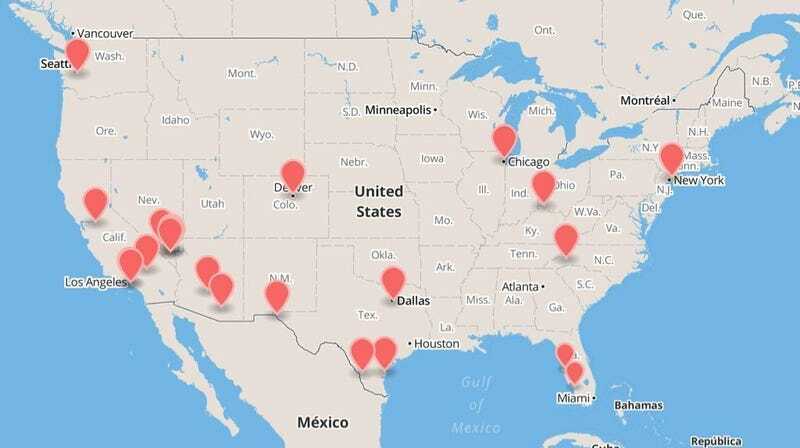 This map shows the locations of 17 mysterious cell towers in the United States that aren't part of any known cell phone provider network. Nobody knows where they came from, but they are busily intercepting the communications of any mobile in signal range. What happens next probably isn't good. Over at Popular Science, Andrew Rosenblum has a story about this hidden network of cell phone interceptors that could be snooping on your phone, and even installing malware on it. Rosenblum talked to Les Goldsmith, maker of a secure phone called CryptoPhone, who discovered at least 17 of these "interceptor" towers in the United States. They seem to exist purely to gain access to as many phones in range as possible. He points me to a map that he and his customers have created, indicating 17 different phony cell towers known as "interceptors," detected by the CryptoPhone 500 around the United States during the month of July alone ... Interceptors look to a typical phone like an ordinary tower. Once the phone connects with the interceptor, a variety of "over-the-air" attacks become possible, from eavesdropping on calls and texts to pushing spyware to the device. "Interceptor use in the U.S. is much higher than people had anticipated," Goldsmith says. "One of our customers took a road trip from Florida to North Carolina and he found 8 different interceptors on that trip. We even found one at South Point Casino in Las Vegas." Who is running these interceptors and what are they doing with the calls? Goldsmith says we can't be sure, but he has his suspicions. "What we find suspicious is that a lot of these interceptors are right on top of U.S. military bases. So we begin to wonder – are some of them U.S. government interceptors? Or are some of them Chinese interceptors?" says Goldsmith. "Whose interceptor is it? Who are they, that's listening to calls around military bases? Is it just the U.S. military, or are they foreign governments doing it? The point is: we don't really know whose they are." Goldsmith admitted later that it's unlikely that a government agency like the NSA would do something like this, because they can simply go to the service providers themselves and get the data they want. Indeed, in 2006 a whistleblower at AT&T revealed that the NSA had a "secret room" at the company's San Francisco facility where it was snooping on every piece of data that traveled over the network. So the security agency would hardly need one of these interceptors. The question is, who does? Anyone who is intercepting your phone communications can do a lot more than listen in on phone calls or texts. They can install a program that gains full access to the data stored on your phone, and even converting your mobile into an eavesdropping device that listens to what you're doing even when you think the phone is turned off.